Lawman, gunfighter, gambler and well-known Old West character, Bat Masterson was one of the very few who lived during the lawless days of the Old West who wasn’t there to make a name for himself, or to count the notches on his belt. He was actually a genuine and honest man, who didn’t have a reputation for violence, but, was loyal to the end, in defending his friends. William Barclay Masterson was born on November 26, 1853, in Iberville County, Quebec, Canada. His father, Thomas Masterson was born in Canada and by occupation was a farmer. His mother, Catherine McGurk, was an immigrant of Ireland. Bat was the second child in a family of five brothers and two sisters. They were raised on farms in Quebec, New York, and Illinois, until they finally settled near Wichita, Kansas in 1871. During his boyhood years, he became an expert in the use of firearms and accompanied expeditions that went out to hunt buffalo. In the Fall of 1871, 18-year-old Bat headed west to hunt buffalo along with his 19-year-old brother Ed. During this time, he camped with hunters working along the Salt Fork River in present Comanche and Barber Counties in Kansas and during visits to other buffalo hunting camps, the brothers met several men who would also become legends in western history, including Wyatt Earp, Billy Dixon, Tom Nixon, and “Prairie Dog” Dave Morrow. The nickname “Bat” was given to him by his companions one day while out on one of these trips, the name coming from Baptiste Brown, or “Old Bat,” whose fame as a leader, hunter, and trapper was well known in the generation that preceded Masterson upon the Western stage. In the summer of 1872, Bat and Ed worked on a construction crew that was expanding the Santa Fe railroad to Colorado. That winter, they returned to buffalo hunting and were joined by their younger brother, Jim in their camp along Kiowa Creek southeast of Dodge City. In January 1873, the Masterson brothers gave up buffalo hunting. Bat remained in Dodge City, but his brothers returned to the family farm in Sedgwick County. However, Ed was soon back in Dodge, just the following month, and went to work in the Alhambra Saloon. Bat returned to buffalo hunting but, the number of buffalo were becoming fewer and fewer. By 1874, the vast numbers of buffalo roaming Kansas had been slaughtered, so many of the hunters moved south and west into what was hostile Indian Territory. In response, several merchants from Dodge City, Kansas following the buffalo hunters south into the Texas Panhandle, established a large complex near the Fort Adobe ruins called Adobe Walls. The business included a corral and restaurant, with the primary purpose of serving the ever-increasing influx of buffalo hunters in the area. In April 1874 a second store was opened, soon followed by a saloon and blacksmith shop. By the end of spring, some 200-300 buffalo hunters roamed the area, and trade at Adobe Walls was booming. However, several Indian tribes in the area correctly perceived the post and the buffalo hunting as a major threat to their existence and attacks were being made on some buffalo hunters. The hostile environment; however, didn’t stop Adobe Walls saloon owner, James Hanrahan, from leading a party of Dodge City buffalo hunters, including Bat Masterson, southward on June 5, 1874. Along the way, a band of Cheyenne Indians ran off their cattle stock about 75 miles southwest of Dodge City. The hunters soon joined a wagon train en route to Adobe Walls, arriving just hours before the Indian attack, known as the Second Battle of Adobe Walls, took place. Early in the morning of June 27, 1874, a combined force of some 700 Comanche, Cheyenne, Kiowa, and Arapaho warriors, led by Comanche Chief Quanah Parker and Isa-tai, attacked the buffalo camp. The 28 men, including Bat Masterson and Billy Dixon, took refuge in the two stores and the saloon. Despite being dramatically outnumbered, the hunters’ superior weapons repelled the Indian assault. After four days of continuous battle, about 100 men arrived to reinforce the post and the Indians soon retreated. While estimates vary as to the losses, as many as 70 Indians were killed and many others, including Parker, were wounded. The men at Adobe Walls suffered four fatalities. In response to the incident at Adobe Walls, Colonel Nelson A. Miles was ordered to lead an expedition against the Indians of the Texas Panhandle in what would become known as the Red River War. Masterson joined the expedition as a civilian scout and a teamster working out of Fort Elliot in what was then called Sweetwater, Texas (now Mobeetie). However, the next spring he was back to buffalo hunting and spending time at his friend Charlie Rath’s store, located about five miles from the fort, which had become the “headquarters” for the buffalo hunters. He was also a frequent visitor to the many saloons in the area. By early 1876, he was working as a faro dealer in Henry Fleming’s Saloon. On January 24th, he became embroiled in an argument with Sergeant Melvin A. King over a card game and a dance hall beauty named Mollie Brennan. The argument quickly led to a gunplay and King was left dead. However, in the melee, King’s shot passed through Mollie Brennan’s body, killing her, and then hit Masterson in the pelvis. The injury caused Bat to walk with a limp for the rest of his life. 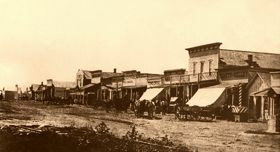 After he recovered, Masterson returned to Dodge City, Kansas where he became a lawman along with his friend Wyatt Earp under Ford County Sheriff, Charles Bassett. These were the years that Dodge City was known as a “wicked little town.” Cattle drives had replaced the buffalo hunters as longhorn cattle were driven up from Texas along the western branch of the Chisholm Trail to the railroad. For the next ten years, over 5 million head were driven on the trail into Dodge City. In July 1877, Bat was appointed under-sheriff of Ford County under Sheriff Charlie Bassett. That very same month, his brother Ed Masterson became an assistant marshal in Dodge City. Bat officially took the office of sheriff in January 1878 and wasted no time in putting his talents to work. On January 27, 1878, Dave Rudabaugh and four other men attempted to rob a train at Kinsley, Kansas Their robbery attempt was ineffectual and the bandits fled. 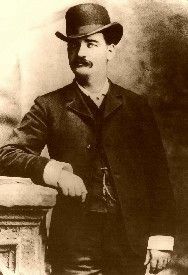 On February 1st, Sheriff Bat Masterson led a posse, which included his brother, Ed Masterson, in pursuit of the would-be robbers. They captured two of them — Dave Rudabaugh and Edgar West, and the other two men were apprehended soon after.